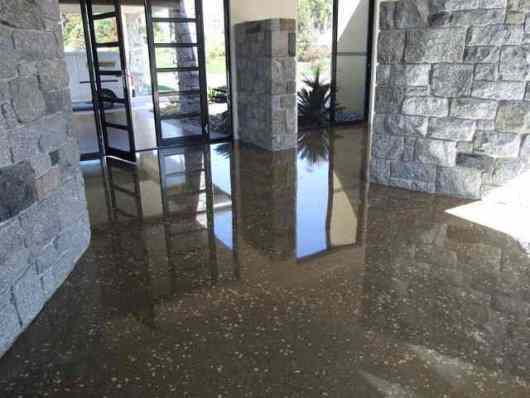 This is short intro page about polished concrete floors. It comes about from a submission that I received from a reader, Clint Fudge who runs a floor sanding business in Victoria,(Australia). The text and comments are all by Clint. Polished concrete - entrance with class, hard wearing, low maintenance. Here is a floor I coated a few years back. It was a single pack polyurethane in un-labled cans that the owner supplied so I have no idea what brand, or what company made it. This floor has eight coats. Concrete seems to need more coats than timber (three is standard for timber) so plan on being generous with the coats. Whatever you do to the concrete prior to applying the coatings will be visible, such as patch ups, ground out spots, that sort of thing. However, at the end of the day it will still look pretty damn good. The floor in the pictures (above and below) were ground down prior to being finished with the polyurethane. The edges are cut in with a good quality brush and the rest of it is rolled on with a Mohair roller. When coating concrete you have to go like buggery, as there are no places where you can stop, and if you do stop you risk leaving over-lap marks. So you have to get on with it. 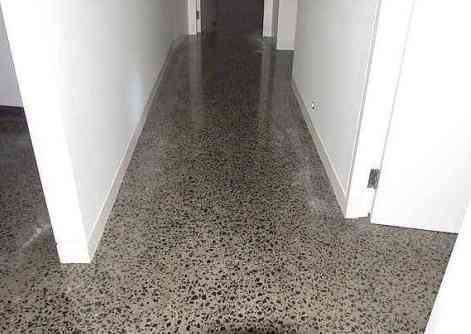 Polished concrete - a beautiful floor in an apartment, easy to clean. Polished concrete - not quite finished yet but already looking great. Here is another house, (same client,different house) although these pictures are not of the final finish and the eventual final coat was a satin finish rather than a gloss. Still looks pretty good. Thanks for that Clint. An excellent article. 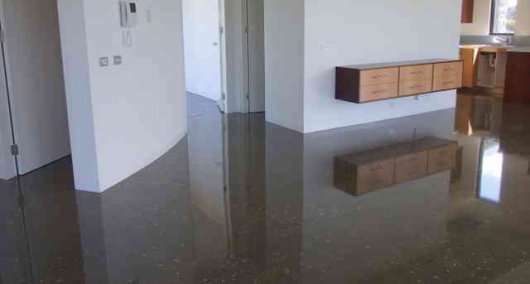 I have done a few polished concrete floors, but I have never taken them to the finish that you achieve. In my experience the owner usually finds the process too expensive and settles for less that a perfect finish. The actual grinding process takes up time and money, so as a result, in my experience, there are few people like Clint's client willing to go for a perfect finish, or indeed guys like Clint that can provide it! Go To Top : Polished concrete floors.